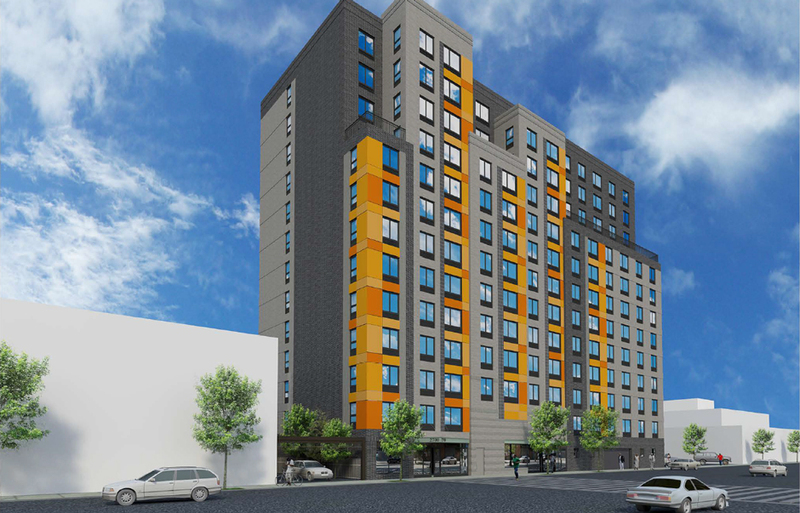 Kingsbridge Heights is a 13-story affordable housing building developed by L+M Development Partners and B&B Urban. The 150,000 SF building contains 136 apartments as well as 1,200 SF of ground floor commercial space and 17 parking spaces. The project includes 40 units of supportive housing for formerly homeless families, with services provided by the non-profit Center for Urban Community Services, as well as 70 units of affordable housing for low-income households earning under 60% of AMI and 25 units of affordable housing for moderate-income households earning under 85% of AMI. Residential amenities include an on-site superintendent, a community room with kitchenette, computer lab and library, fitness room, laundry room, and landscaped outdoor space. Designed as a green building, Kingsbridge Heights Apartments will meet NSYERDA and Enterprise Green Communities program standards and include green features such as a photovoltaic solar array and energy efficient appliances.